For use with Caravan Displayshade, Aluma, or Classic series 10 ft. x 15 ft. frames. Dimensions: 10 ft. x 15 ft. This Caravan Professional canopy replaces your 10 ft. x 15 ft. canopy top. You simply slip this canopy top over the top of the existing frame for quick and simple assembly. This canopy top is made with 100 percent 500 denier polyester fabric for the utmost in strength, durability, and protection. This top meets both CPAI-84 and ULC-S-109 fire codes and is not only fire resistant, but also water resistant, and protects from damaging UV rays. 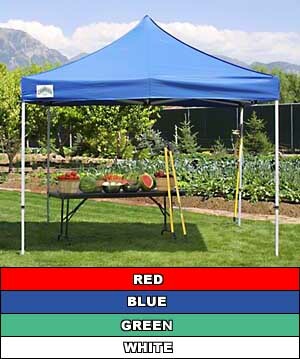 This canopy top has a 2 year limited warranty and comes in either red, white, blue, or green standard or 14 custom colors. What are the dimensions in the bag? This item when folded is 18 x 12 x 10 in. I purchased 3 aluminum Caravan canopies about 8 years ago. I have a 10x10, 10x15, and 10x20 and all 3 still work. I have replaced the tops 3 times and each time it has been a perfect fit. I leave them up about 6 month out of the year they are perfect for sun and rain. ProsFit perfectly every time I need to replace one. Make sure you measure your frame first, I have a 10x15, and a 10x20. I ordered the wrong one once. My old one lasted about 3 1/2 years, but I leave it out around 260 days a year. I leave them out for parties, and for extra shade, and weather protection for my dogs.